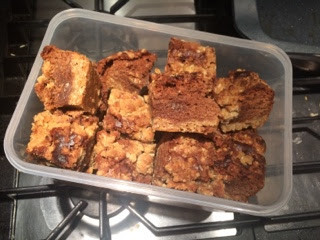 I made these delicious bars to take to the last Staff Meeting of term as my team was on snacks. They went down really well and are a lovely variation on a brownie. Preheat the oven to 180C. Grease and line a 23 x 33 cm baking pan with baking parchment. In a large bowl, combine the flour, oats, brown sugar, baking soda, and salt. Cut in the butter and rub with fingertips until the mixture resembles breadcrumbs. Set aside one third of the mixture and press the remaining mixture into the bottom of the prepared pan. Bake crust for 10 minutes. Allow to cool slightly while you make the brownies. Heat a pan of boiling water. Add the butter and chocolate to a bowl and put the bowl on top if the pan, making sure the bowl does not touch the water. Leave the mixture to melt, stirring occasionally until smooth. Allow to cool slightly. In a separate bowl, beat the eggs, sugar, water, and vanilla until well combined. Mix in the chocolate/butter mixture and continue beating to combine. Using a metal spoon, add the flour mixture, mixing until combined. Spread the brownie batter over oat crust, using a spatula to spread evenly. Sprinkle the remaining oat mixture over brownie layer. Bake for 18-20 mins, until the edges are set. Allow to cool completely before cutting into bars.